Here you can download "The New Prepare for IELTS Academic Modules" which was written by the academics of University of Technology Sydney. This item contains the pdf and the audio files of the listening tests. This book is one of the best IELTS practice materials you can find in the internet and has exercises and tests ONLY for the Academic version of the IELTS. Here you can download "The New Prepare for IELTS General Training Modules" which was written by the academics of University of Technology Sydney. This item contains the pdf and the audio files of the listening tests. 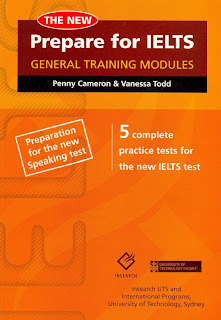 This book is one of the best IELTS practice materials you can find in the internet and has exercises and tests ONLY for the General Training version of the IELTS. This one installs itself on your computer and puts you on exercise tests via your browser. It has all the modules; listening, speaking, reading and writing. Additionally, this item is a freeware. You can download this Official IELTS Practice Material which was updated in March 2009. This item contains the pdf (with the 9th page included unlike the pdf provided by other websites) and both of the listening and speaking audio files. This item is one of the latest IELTS practice materials you can find in the internet and has exercises and tests for both the Academic and the General Training version of the IELTS. Everyone who is going to take the IELTS can visit IELTSPass and practice upon the materials linked on this blog. The materials include both the versions of the IELTS, which are Academic and General Training. You are totally free enjoy!